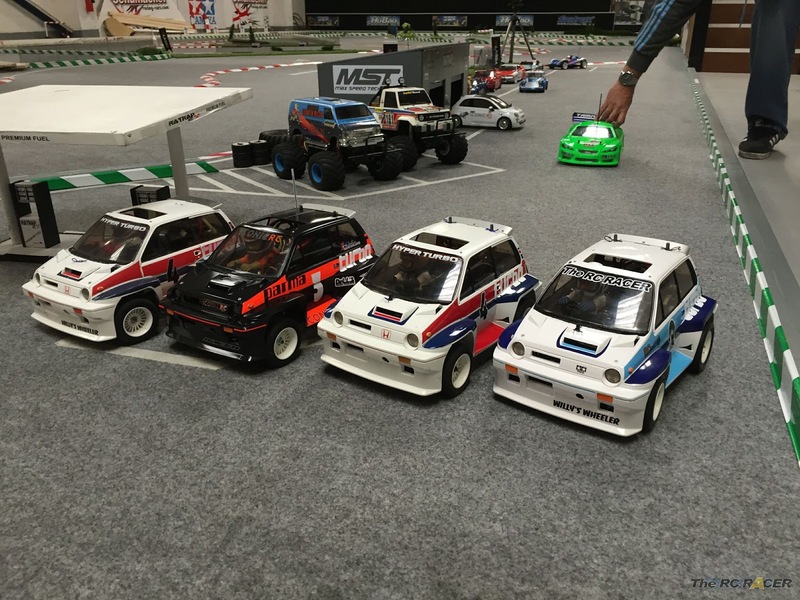 There are certain RC cars that are iconic, they are either innovators or they capture the imagination of the buying public. Tamiya's Honda City Turbo or Willys Wheeler as it was called then, was such a car. 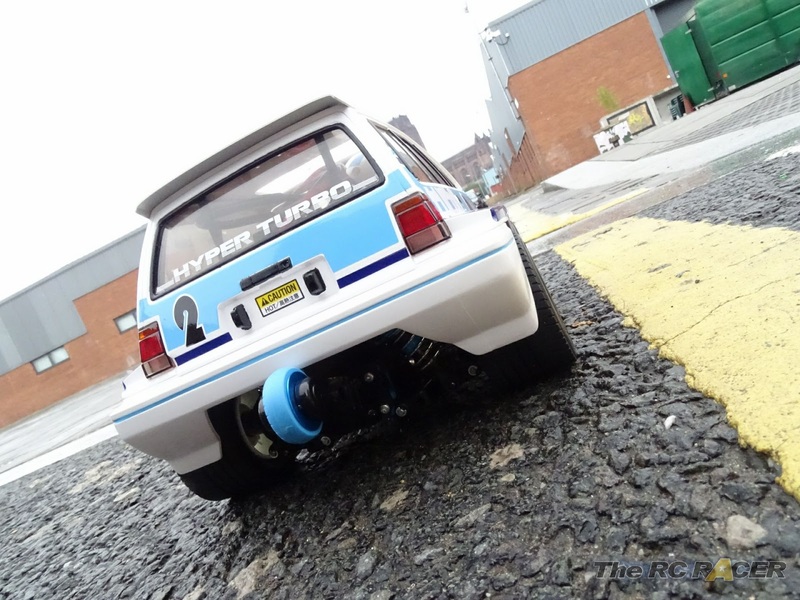 On it's original release in 1983 the cartoon proportions of it's beautifully detailed shell,coupled with its outlandish stunt based handling quickly established itself into becoming a cult car. Over the years this earned it a reputation of being a well revered classic. The prices on Ebay have become astronomical for the originals, making them out of reach for many enthusiasts. However Tamiya took a lot of people by surprise and announced a new version of this classic car, ditching the very dated chassis of the original, and placing it on top the the excellent WR-02 chassis. After what seemed like an agonising few months the car was released and a nice big box appeared soon after ready for review. The box still has the original art that was used on the first release, helping it rekindle all of those emotions that I had as a young boy staring at the boxes in my local hobby shop. When you open the box you soon realise that most of the size is to do with the beautifully detailed shell that takes pride of place. There are actually only a few part sprues in the box so this build will be pretty simple. Tamiya has made this kit simple for all comers and some of the more tricky parts are already pre-assembled. 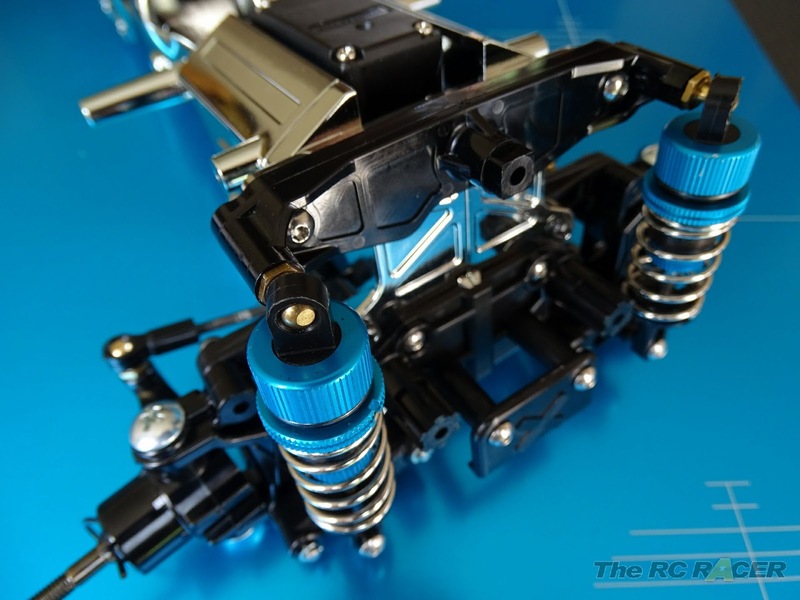 The rear gearbox is expertly assembled and the kit includes the Torque tuned Motor as Std. 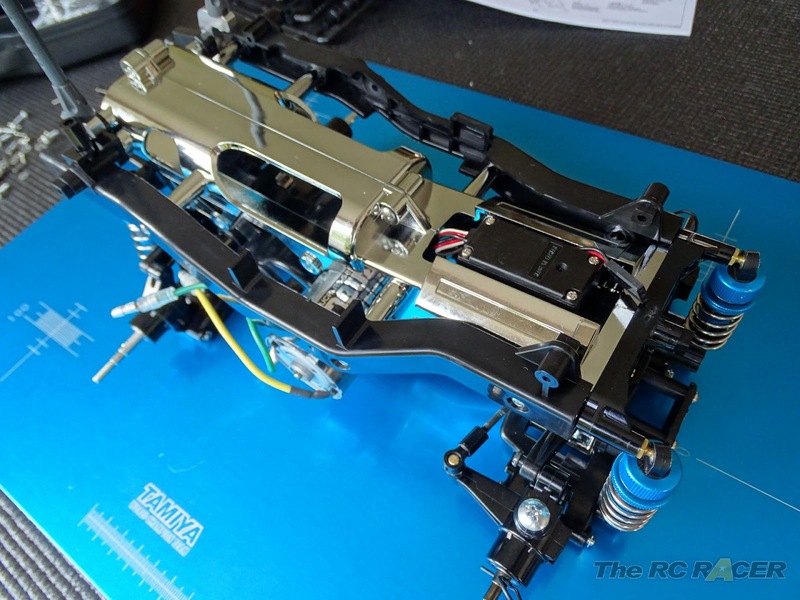 First up you can see that the whole rear gearbox is already assembled, this is a great for a beginner as it is one of the more fiddly jobs. The gearbox is not ball raced, and I'm going to be fitting bearings in this car so lets open it up and take a look. To replace all of the plastic and brass bushings you will need 16 x 1150 bearings. I purchased mine from www.RCbearings.co.uk. 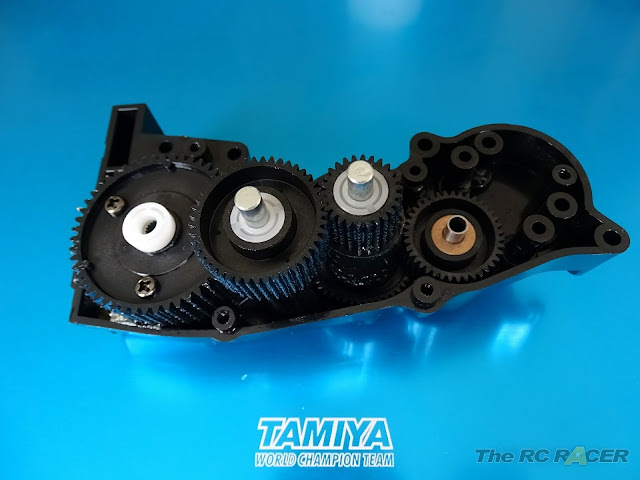 The differential is a classic Tamiya bevelled gear diff. It is not sealed so if you want to tune it you will be best of to just add a drop of sticky thick AW-grease to stiffen it up a little. For this build I am just leaving it as it comes. A thick rear diff on a RWD car is not ideal for a car that I want to whiz around at my local tight carpet track. When the gearbox was open I replaced the plastic and brass bushings with the 1150 bearings and then screwed the car back together. The rear arms are simple two piece affairs that fit together with a couple of screws each. These arms are used on a range of Tamiya kits. These are then attached to the gearbox with screw pins. 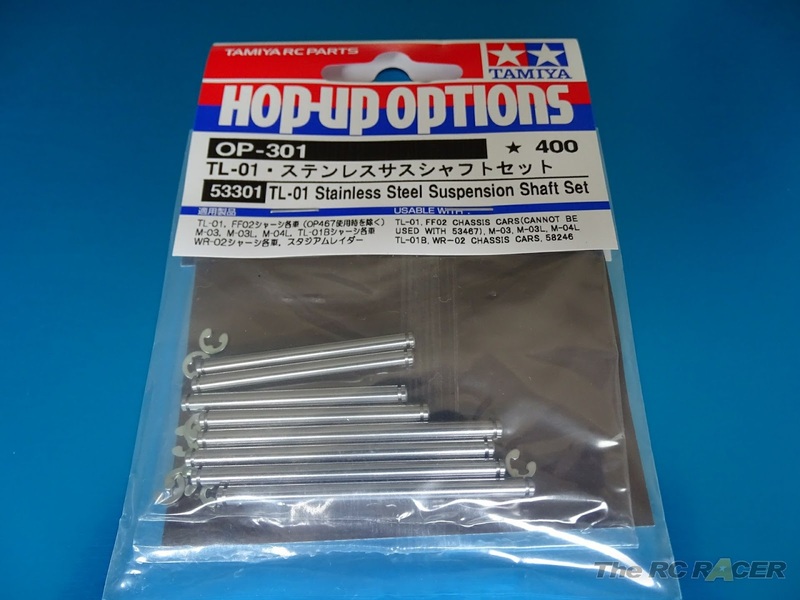 For my build I am actually using the TL-01 Stainless Suspension shaft set (Tamiya 53301). I like these as they keep the arms free, and they are held in with C-Clips so they will not come loose over time. I attached the lower arms, then it is time to fit the upper arm using a 3x14mm step screw. 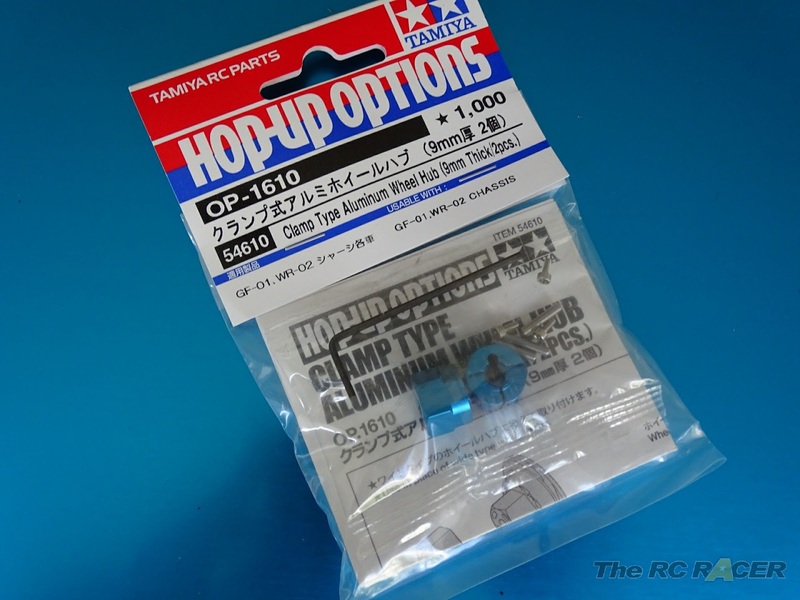 I've been building Tamiya kits for decades and you should always ensure that these are not screwed in too tightly. 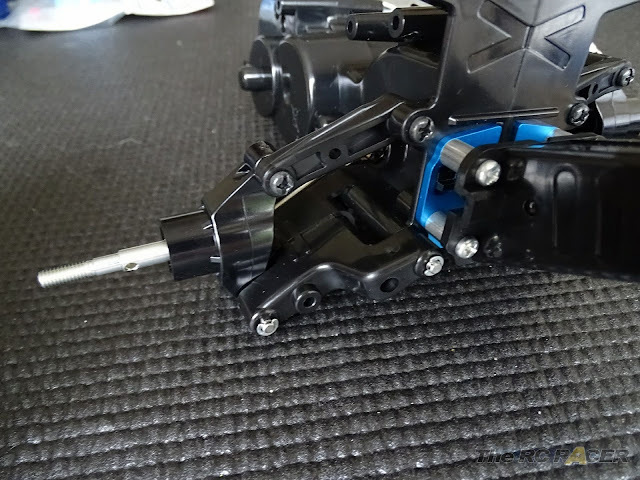 Tip- With these Step Screws I usually screw it in until it's feels tight, this normally impedes the movement of the arm, so I then back out the screw in small increments until the arms fall under their own weight, this reduces slop and ensures that the suspension movement is still free. For those into bling, roller is always on show so it helps make an impact! The wheelie roller is mounted on a strong 5x21mm steel shaft that is sandwiched between two sturdy plastic halves. 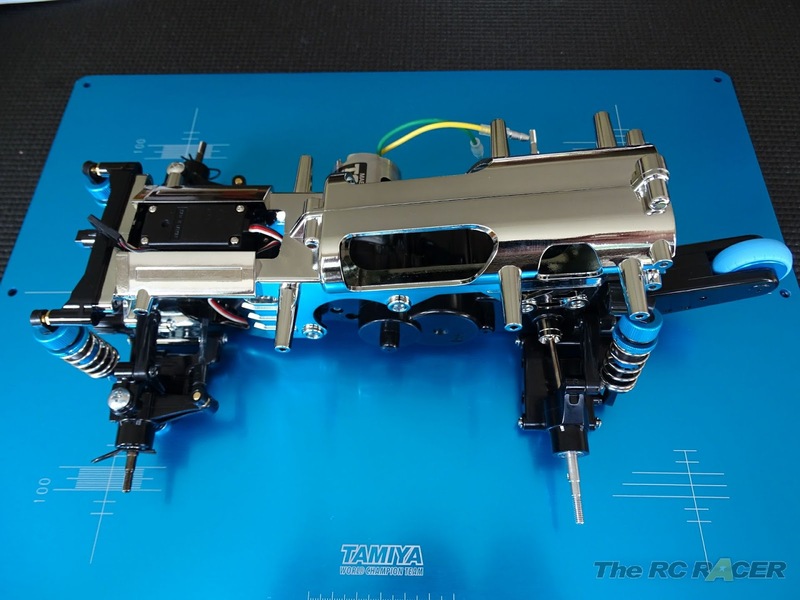 This is then mounted onto the rear of the chassis, I also added Tamiya 54597 which is an aluminium gearbox support. This will ensure the halves of the gearbox mouldings stay locked together if you use a more powerful motor, and it can help strengthen the wheelie attachment. The wheelie bar is mounted away from the chassis with some 8mm spacers. This is to ensure that the shell does not rub against the wheelie bar. 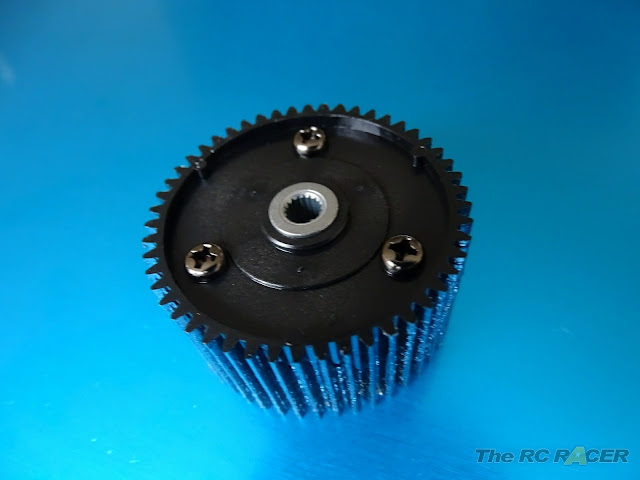 At this stage you also fit the gearbox joints into the bevel gears, I never add grease on these as is shown in the instructions as it just gets more mess in the diff over time. This car has TL-01 rear uprights and the car comes with long rear axles. Here I simply fitted the bearings, and slid the drive shafts into the cups and attached the step screw. One thing that I should call out is that the WR-02C chassis uses long rear axles, this means that Tamiya 54394 Assembly Universal shaft will NOT fit this car, as the axle is too short.. hopefully a long axle version will become available at some point. We have direct steering set-up on this car. 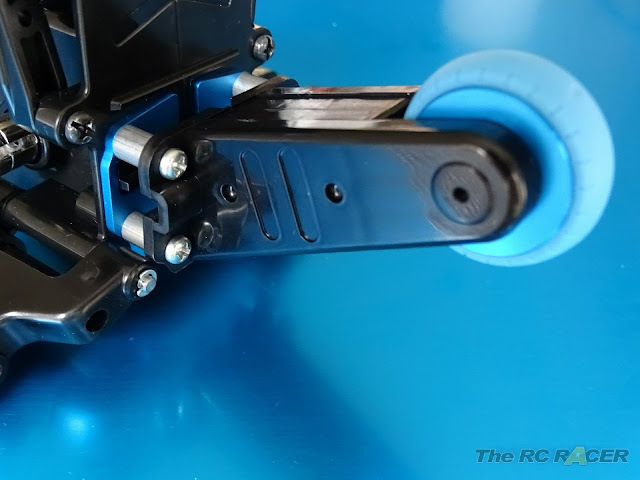 The steering arms are attached to the servo with a large Servo saver. 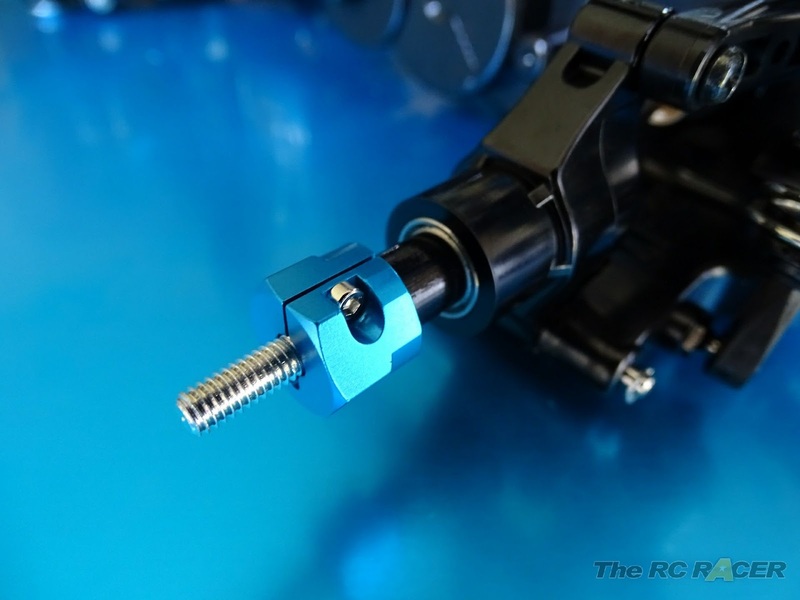 The car comes with threaded shafts and these connect to 5mm adjusters that then simply click onto the ball connectors. 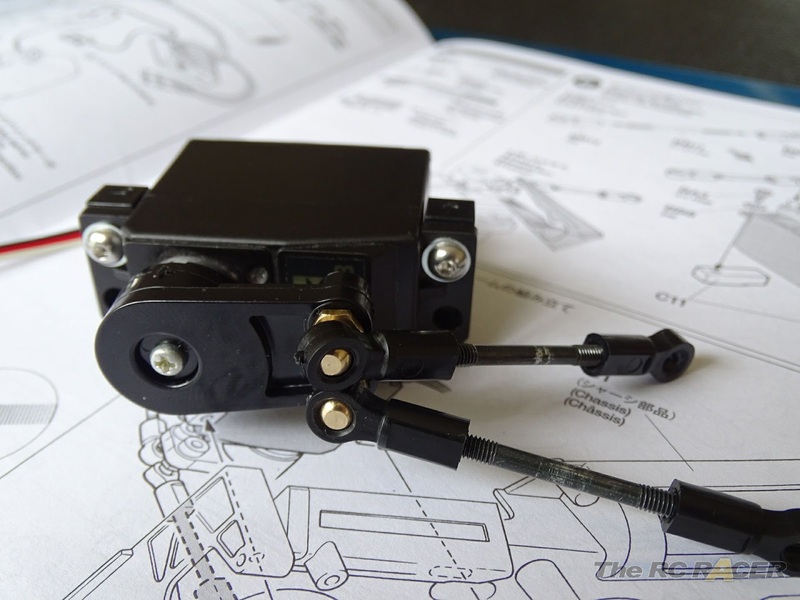 It is a good idea to connect up your electrics here to ensure that the servo is centred before you attach the servo saver. Otherwise it can be more difficult once the car is fully assembled. Once this is done you can mount it to the chassis half and join them together. 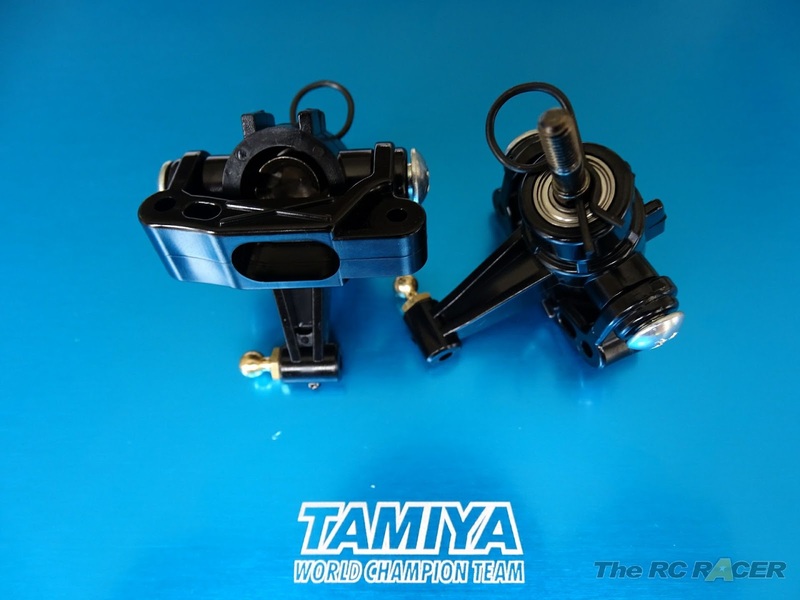 Again the front arms are a two piece affair like the rears, however here you only need to attach one screw. The U shaped shaft will be held in place with a bumper mount later in the build. Once these are assembled you will then mount them onto the chassis with a U-Shaped shaft. As I was using the suspension shafts I used those instead. 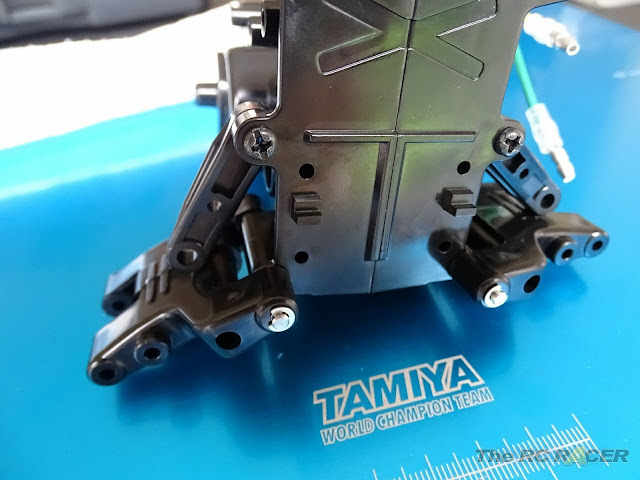 You also attach the front shock tower at this point, it's made from standard Tamiya RC kit plastic, but it's thick and will be stiff enough to ensure it doesn't affect the car's handling on track. Now it's time for the front axles. These are held in place with meaty uprights that are attached with chunky Step screws. At this stage you fit all of the bearings and hold the axle in the hub with the large snap pins included in the box. The Honda City Turbo comes with friction dampers. And the kit handles surprisingly well with these. 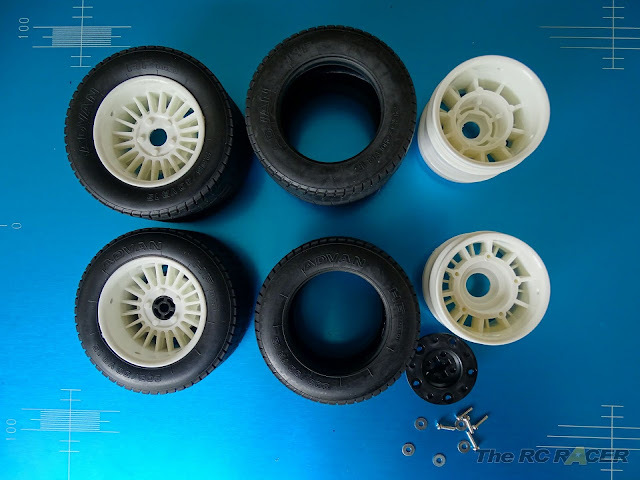 They are very easy to build as long as you ensure that you cut the rubber tubing to the correct measurements shown in the instructions. The springs that come with these shocks are long and they give a good progressive feel as the car leans into the corner. For my build however, I opted to use a set of TRF touring shocks. 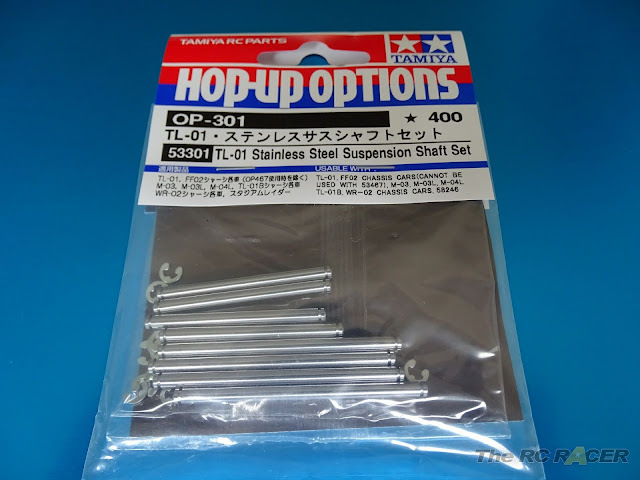 These are shorter than the kit supplied items so I had to use the longer lower shock attachment from a V-Parts sprue. I also used a Tamiya Touring car Silver sping (Between Blue (hard) and Yellow (Med)). As the kit springs are too long. 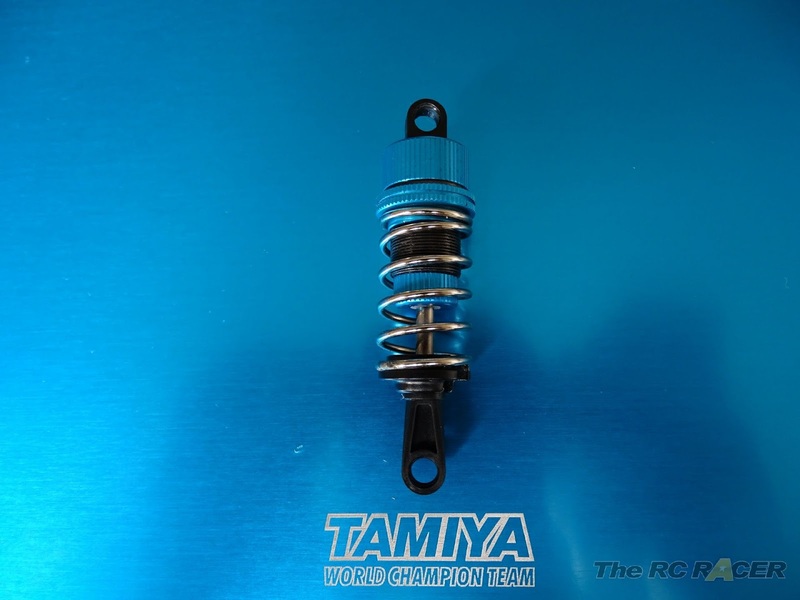 If looking for some alternative shocks, Tamiya makes very reasonably priced Oil filled shocks for the WR-02 which are reliable and can give you that extra damping that you may require to refine the car's handling. With the shocks built it's time to fit them onto the car. The std shocks are mounted with flange tubes and screws, however I had some 5mm ball connectors that I used. The front is now fully sprung. Now it's time to join the two parts of the car together. The chassis takes shape quickly. 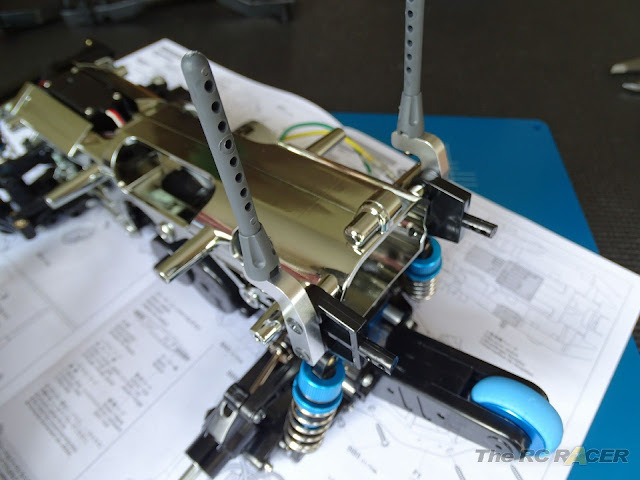 There are 8 screws that you need to attack here, ensuring that the chassis is strong and will not warp once it's taking abuse once you start pulling stunts on the street. To accommodate the large shell, the Honda City Turbo comes with some solid body mount stays. These are made of alloy and hold down the grey stiff plastic body-posts. The bodymounts are very rigid, ensure you tighten them down properly otherwise the shell may move around and rub the wheels. 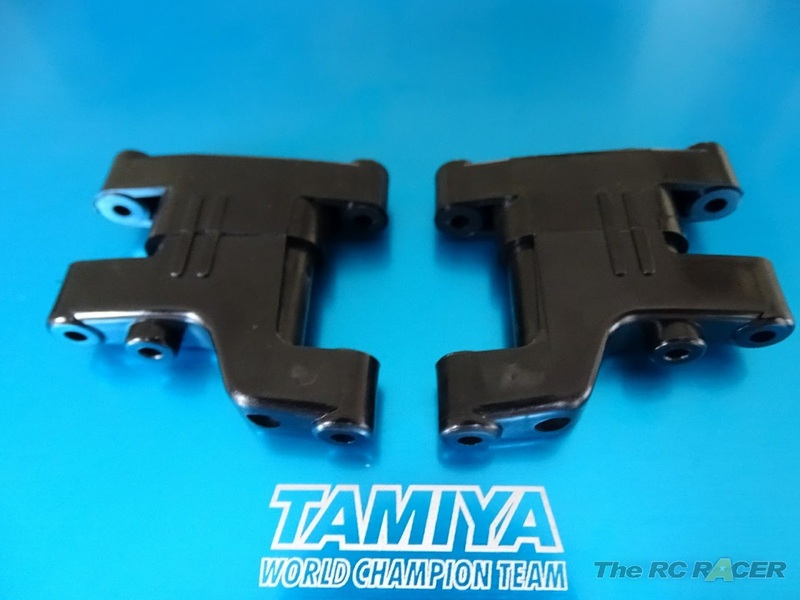 Once these are attached to each other you then attach them to the E4 battery cover holder. Here you need to trim the end of this part, otherwise this part will rub against the shell, and make it difficult to fit. Here you can add the electrics. You will need to mount them on the upper section of the chassis, and it will be best to fit them at the rear. 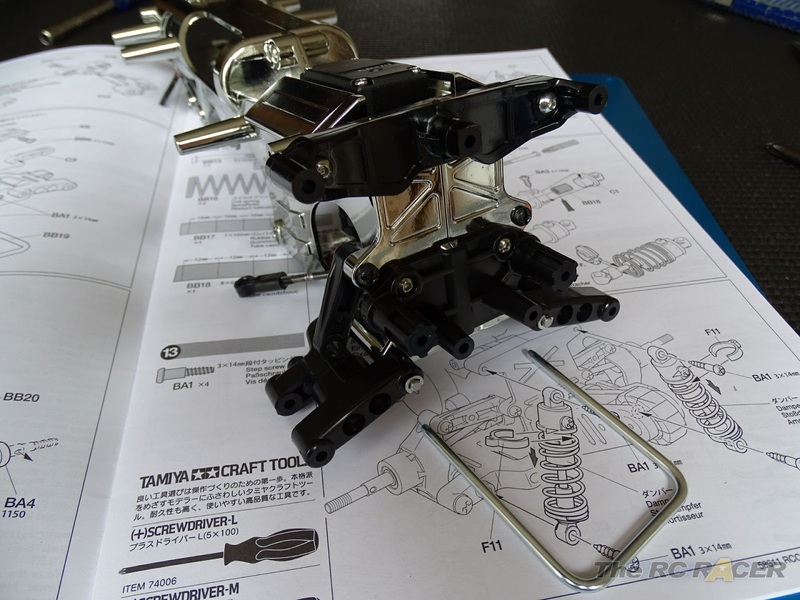 Also here you add the chassis frame sections (F1 & F2). 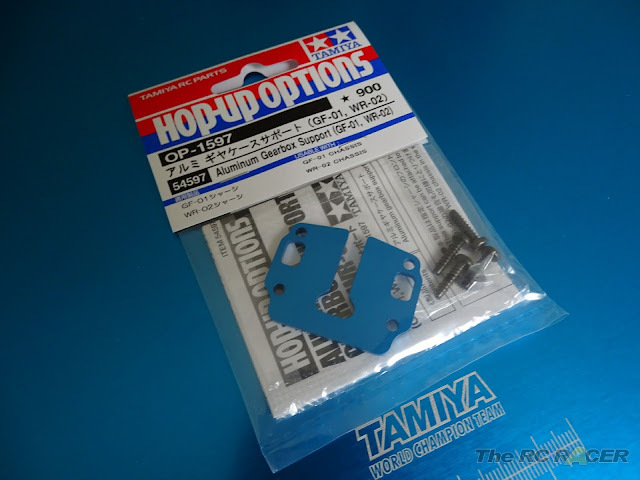 The kit includes Tamiya's TBLE-02S esc. 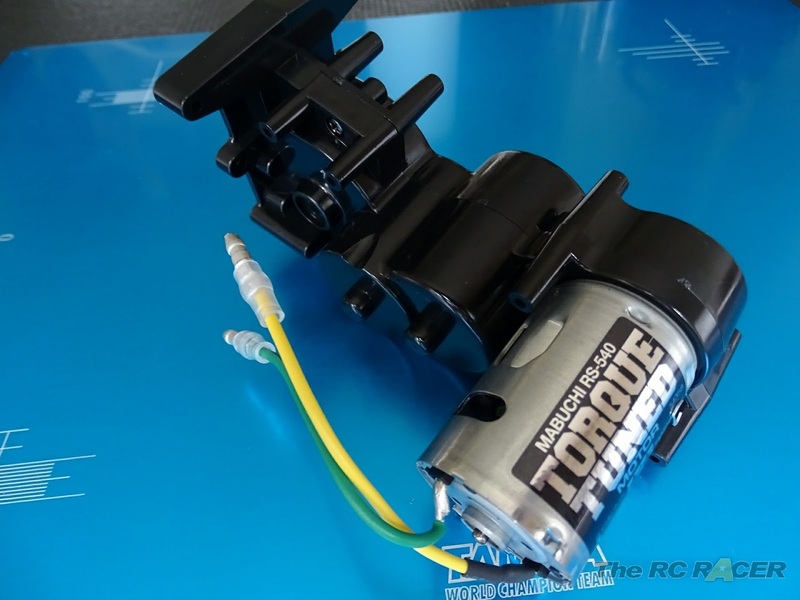 These are a great addition to the kit as they can run the brushed motor included, but you can then just add a brushless sensored motor if you want to upgrade. 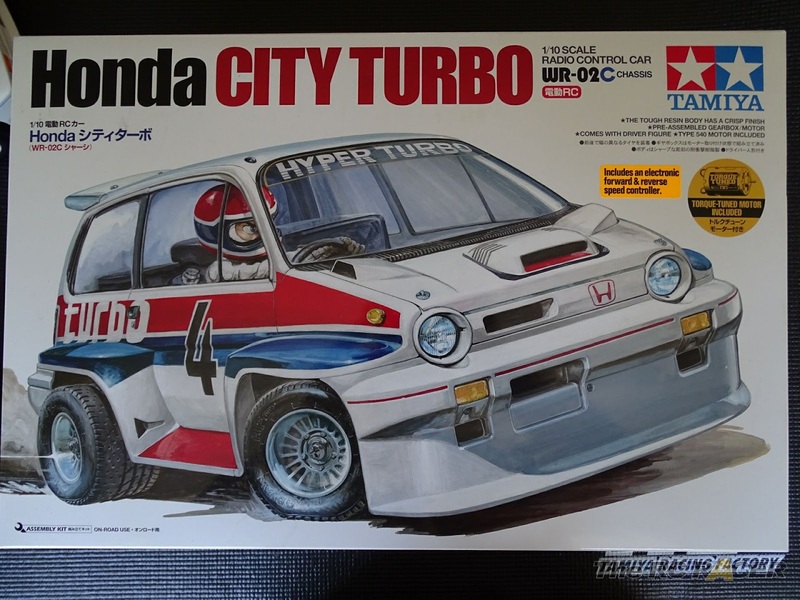 One of the unique things about the Honda city turbo is the wide wheels. 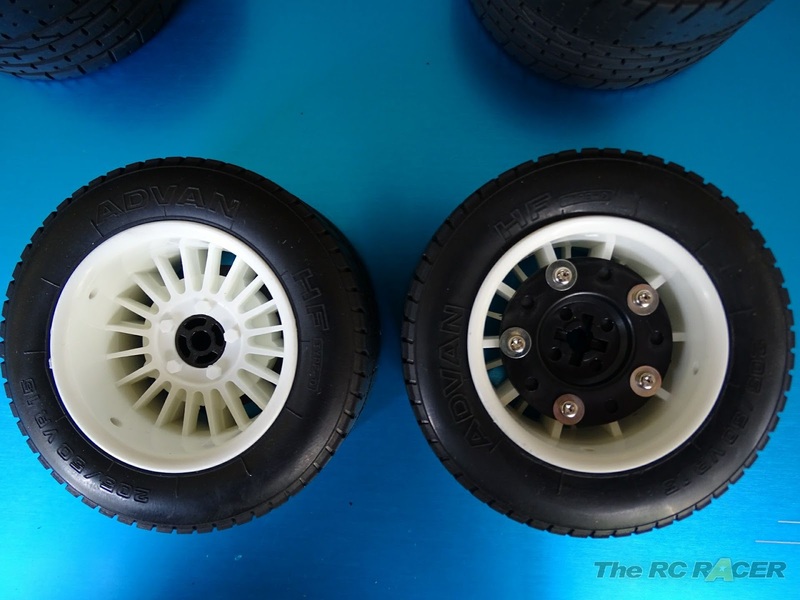 This re-release uses the original cars wheels and tyres (Although these tyres are much softer rubber than the original ones). 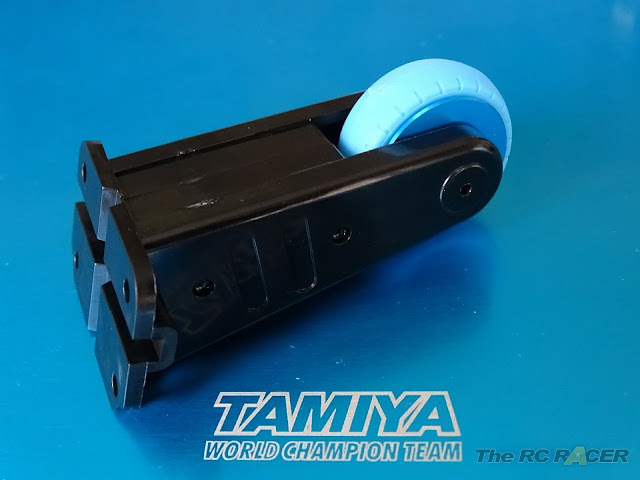 The front wheels wouldn't fit properly on the WR02 chassis so there is an adaptor that is attached to the front wheel with 5 small 2x8mm screws. Once they are assembled you then simply have to fit them onto the car. These are a great upgrade from plastic hex's on any car. The rear uses a 9mm Hex, I used the Tamiya 54610 Clamp type wheel hub. This helps the wheels spin freely, and can help you from accidentally over tightening the wheel nuts and stopping the binding. Carlos Fandango super wide wheels coming soon! As mentioned before the rear axle is very long so you need to add a spacer first and then attach the hex hub. You then just have to add the wheel nuts. This is easy on the rear, for the front I would recommend that you put the car on the side and slide in the front pin and then pop the wheel on and hold it down whilst you tighten the nut to stop it slipping. The build is really straight forward, and you can get it done easily in a few hours, now it's time to work on the body.. this can take time. 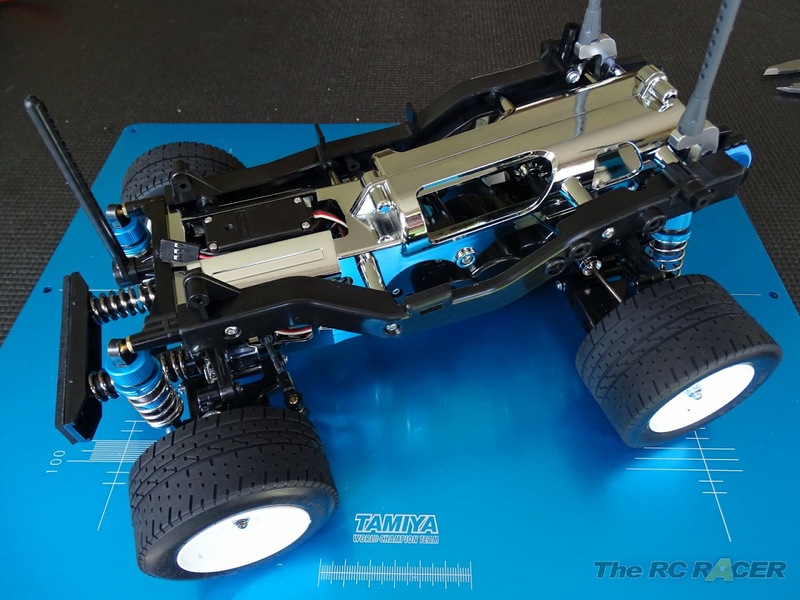 The shell is classic Tamiya, the ABS body is very detailed and it is full of character. 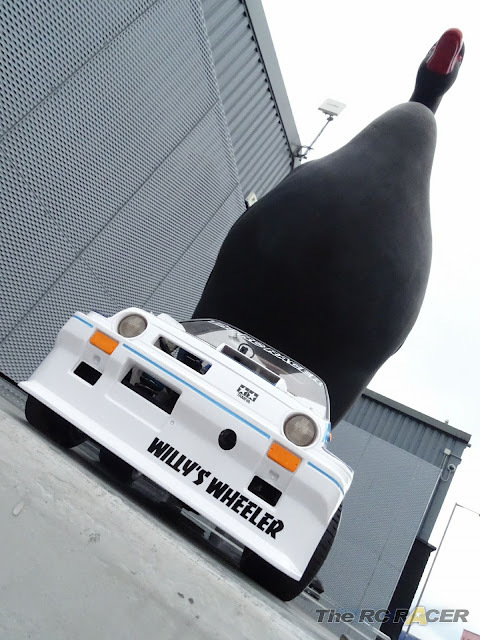 Talking of characters, Willy is there, itching to take the car for a spin. Here he is in TheRcRacer guise. I painted the shell in the recommended colour (TS-26 pure white). However I wanted to make the car look different so I had my friend make up some decals for the car to make it look a little different. 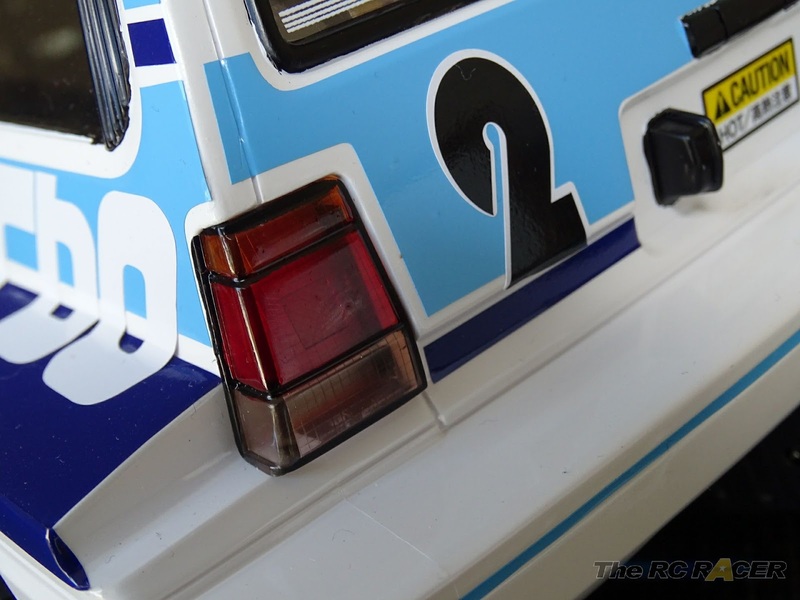 Once they were attached it was time to fit the glass and aluminium rear spoiler. The treads are fine for the wet! The detail on this shell is amazing! After the car was built I was eager to try it out. 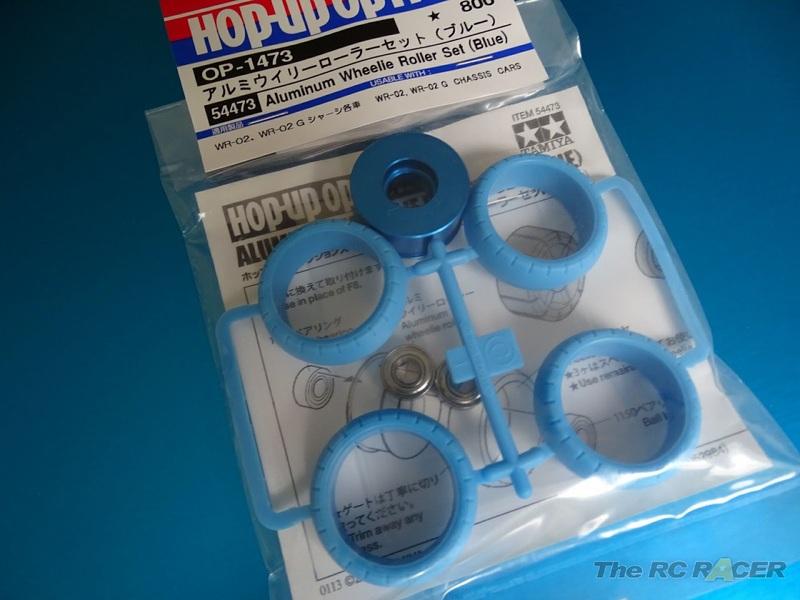 As luck would have it I went to the Iconic RC northern meet at Rc Modelshop direct. The track was great and there were a few Honda cities already there. 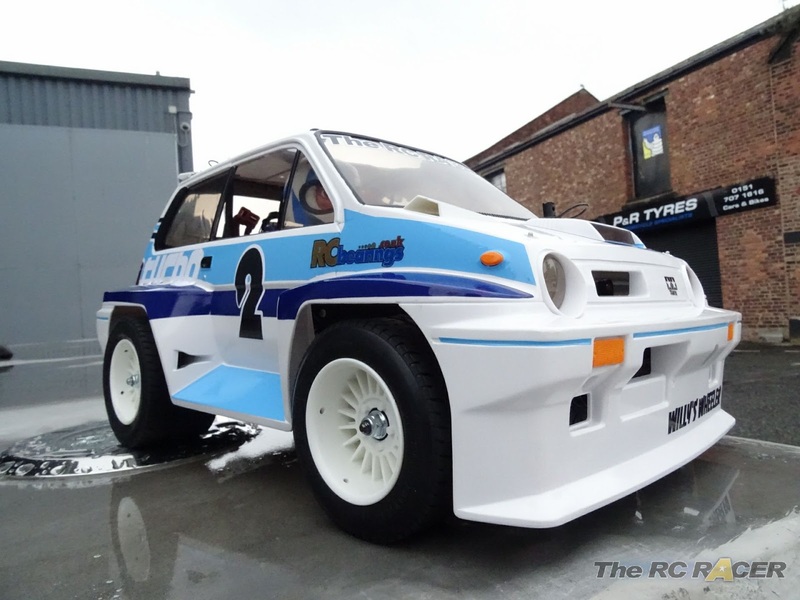 I didn't know what to expect when it launched off, the comical look of the car doesn't imply that anyone has designed this car to be a serious racer. It only took me a couple of corners to get used to the car and I was surprised at how good it felt to drive. The Honda City Turbo handled really well around the track, the car was responsive to my steering input as it weaved around. A great day out, there is even an original wheeler in this line up. 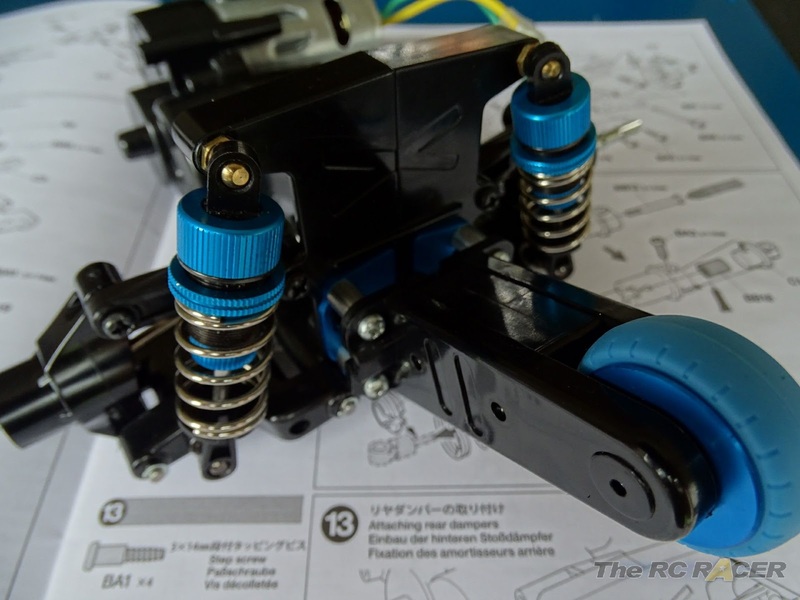 The weight of the shell and the balance of the shocks in the car would allow it to lean gently into a corner and you can read how the car is responding to the track surface really easily. This coupled with the beautiful shell just made me grin as I drove the car around. 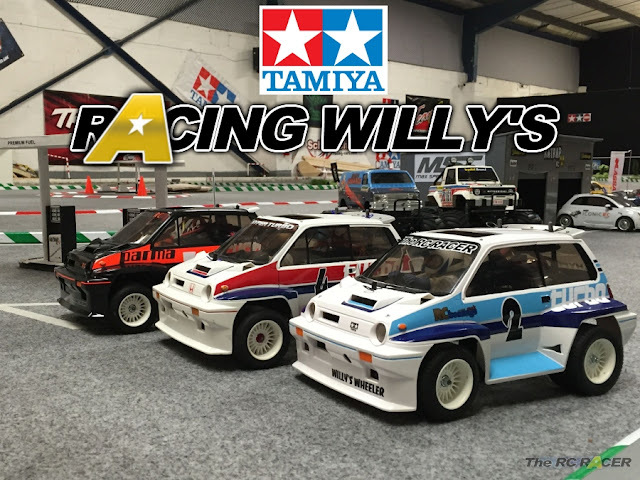 It's not going to be chasing any BRCA trophies soon, but these are good little cars to run, and a whole group of them racing would be great fun. Unfortunately for me I got a little carried away and I whacked into a plank at the track.. I could see plastic flying into the air and my hear sank.. I thought I had destroyed the shell. When I walked over it was better than I thought, the bonnet vents had popped off, (Just needed glueing back on). The shell itself was fine with no cracks and it had hit it with a massive amount of force, I think the spring loaded bumper really saved me there. 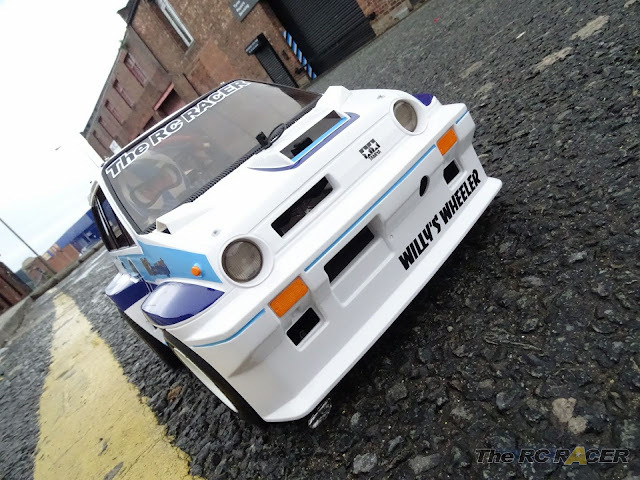 The next day I took the car back out at a local car park to test the wheelie capability, the car was able to pull a wheelie, but it was not as eager to do it as my other WR02 (Wild Willy 2). Although when you manage to do a wheelie I think the car felt a little more stable. The car has attracted a lot of attention with my friends and racing buddies, there are a few orders already placed and we are hoping to run a heat of these soon at my local club.. Here is a great video to show what to expect if you race these cars. The kit included esc is able to run brushed and sensored brushless motors. The only real negative is that the battery holder will not accept square cased lipos. 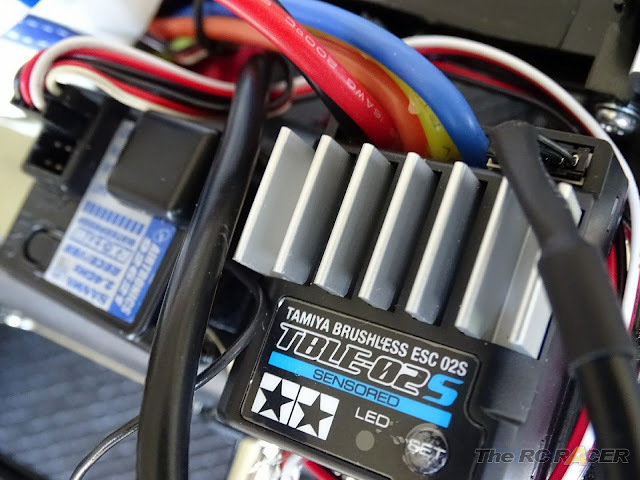 It is fine for 7,2v Nimhs, and some round cased lipos. If you want something that is quirky, easy to build and fun to drive you will be very hard pressed to get something better. I'm very taken with mine (As is everyone else that has seen it) and cannot wait to take it out for another spin. 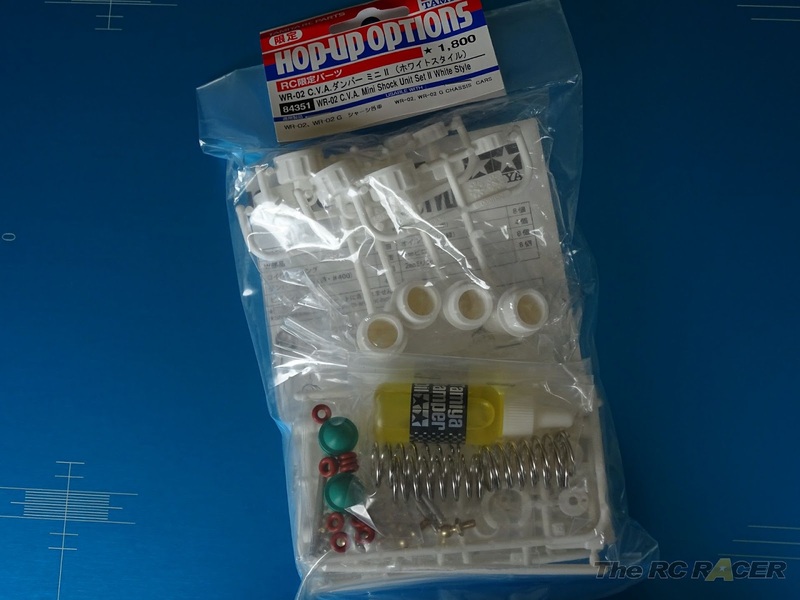 can you provide the part numbers for the springs? Hi. 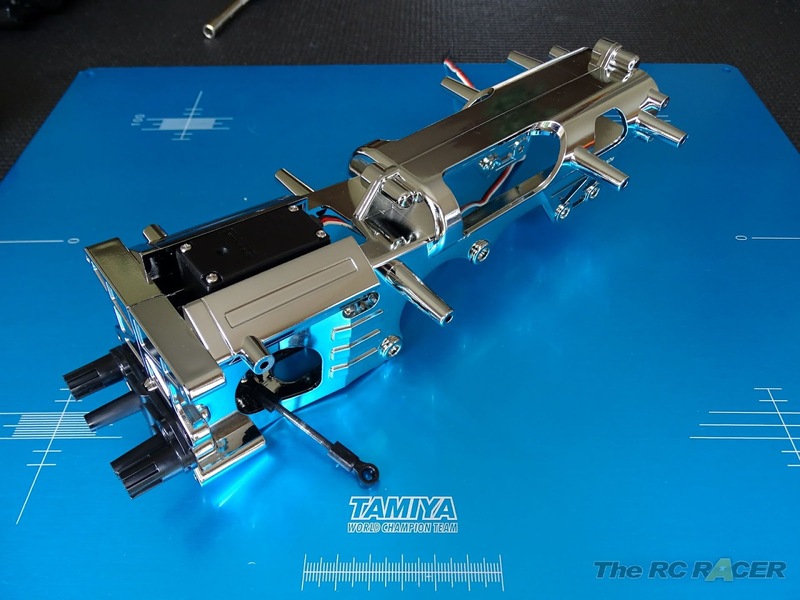 Does the Futaba S3003 servo fit this kit? And can i use any transmitter on this? Thanks.